Tuesday welcomed the first day of spring, a favorite season for many who live in harsh climates. They breathe a sigh of relief when the thaw begins. Many people hate shoveling snow and driving in it so much that they’ve moved to Southern California where you can go all year without seeing a single flake, unless you take a drive to the mountains. 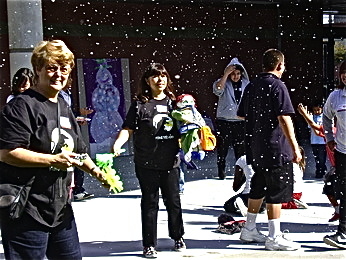 Below, my Monster Moon co-authors Kathy Sant and Maria Toth join the kids at Valadez Middle School Academy in Placentia, California for some flaky fun on a warm October day in 2010 at the Read for the Record event. Students at schools across the country read A Snowy Day by Ezra Jack Keats. with white flakes floating out of the blue California sky! Actually, it was bubble machines up on the roof, and the flakes weren’t even cold. Some of the kids had never experienced real snow and wouldn’t know the difference. However, there was one patch of actual snow on the school grounds that had been trucked in. The small mound was high enough for a short sled ride. Just enough for the kids to get the drift of what the frozen white stuff’s all about. There’s something about those delicate icy flakes that seem magical. 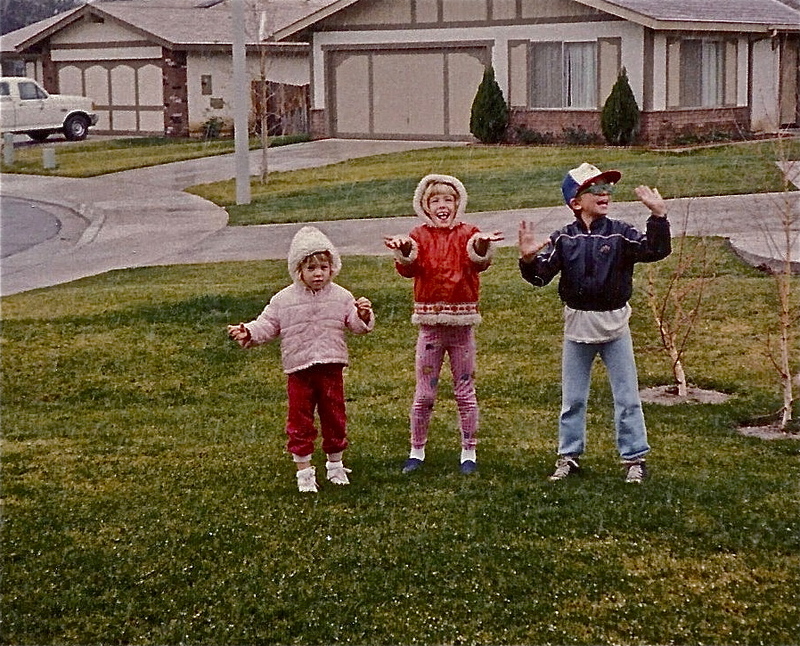 About 25 years ago, Highland, California was treated to a little sprinkle. It barely started snowing, but our kids bundled up and ran outside to play in it. See the tiny white specks? They melted right after they hit the ground! In 2007 most of Southern California got a good layer of the real deal. Newsclips showed families in Malibu building snowmen and making angel imprints. It wasn’t heavy enough to snow anyone in, but many established trees and plants throughout the southland couldn’t tolerate the cold snap and died. In December 2008, our third year living in the High Desert of Southern California, we got snowed in. The cities don’t have snow plows. 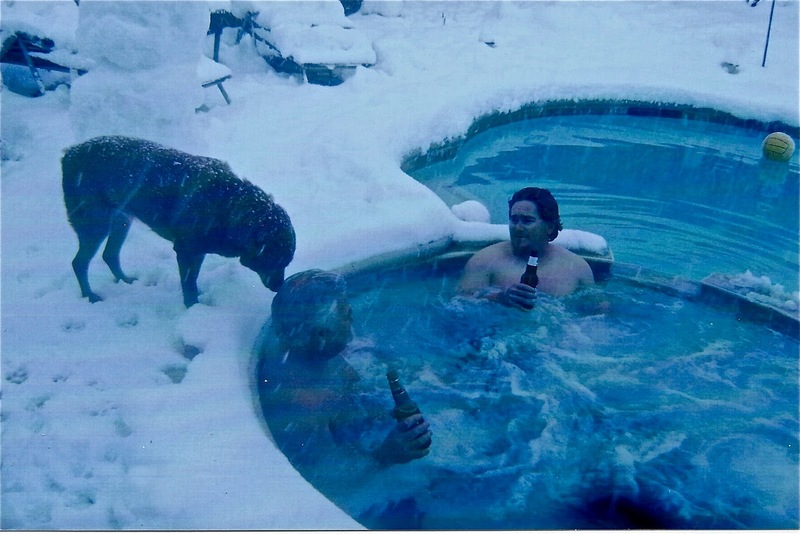 Puck couldn’t get to work, so he went in the jacuzzi with his dad and had a brewski. Look at that pathetic snowman in the background! Our dogs had never seen snow before. They were happier under the patio cover, where it was dry and they didn’t freeze their paws off. Trivia question: How big were the largest snowflakes recorded in the USA? Answer: Fifteen inches in diameter in the state of Montana. Although I live in a mild climate, I’m happy to say goodbye to winter and hello to spring. It’s my favorite time of year, with its gentle breezes, warm sunny days, and new growth. How about you? What’s your favorite season and why? This entry was posted in Uncategorized and tagged Read for the Record, snow in California, Valadez Middle School Academy. Bookmark the permalink. 16 Responses to It Never Snows in California, Does It? That's a big snowflake.The hot tub photos are wild. Not sure I could do that. Spring is probably my favorite too, although there's a certain magic about fall. Snow on the ground = best time for the hot tub! And how fun for the kids – both the real stuff and fake. 🙂 I can't imagine not having seen snow, although we sure didn't see much of it this year, and spring seems to have passed us by altogether. Is that a Rottweiler in the last pic? We have two! They don't like snow, either, and they really hate water! We got more snow this week then we had all winter. The calender may say spring, but it's Canada, it inevitably snows in May. I remember Google put up a doogle on their homepage on the anniversary of the discovery of that snowflake. :)My favorite season is fall. I really don't like temperatures above 80 F, and I love watching the trees in the area turn all different colors. Oh my gosh, those pictures are awesome! It really gives a good idea of how much snow fell. It was certainly more than a dusting! I love Spring too, we have two new baby bunnies as pets and I will begin planting my culinary garden next week! Happy Easter to you & the family Lynn, cute pics!! Winter was a real dud in southeast Pennsylvania this year. The only snow we had was on Halloween and, boy howdy, did that mess things up around here. This week saw a few days in the high 70s and we're all thrilled with that. Winter had its chance; bring on spring and summer. Now, watch it snow like crazy the last week of April! My favorite time of year is October. Because the temps start getting cooler which is great after all the heat of summer (I realize that contradicts my previous statements, but that's how I roll). 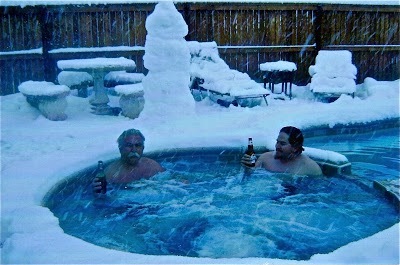 Winter, summer, spring, or fall: there's never a bad time to have a beer in a hot tub. That's a huge snowflake! I don't think I'd be catching that one on my tongue. My favorite season is autumn. I love the cool crisp air and wearing sweaters, the crunch of the leaves and the amazing colors. Autumn is my favourite season, it's a time of new beginnings for me. Your pictures make me smile. But right now all that's falling is rain, and since I'm snug inside it's lovely to watch.I love seeing things bloom in spring, but my favorite time of year is fall, when the air turns crisp and clear. I'm sorry I haven't replied to your comments until now. It's been crazy the past few days with a slab leak and other things. Thank you all for sharing. Seems like the consensus so far is that fall is the favorite season for most of you. I also love to see the changing of leaves, but in California there isn't much of that to see.